This remarkable postcard postmarked 1941 of Schaber’s Cafeteria at 620 S. Broadway, showing an Einar Petersen mural, has been listed on EBay at Buy It Now for $6.99. The Schaber Cafeteria at 620 S. Broadway was built in 1928 by the Schaber Cafeteria Co. (Alfred T. Schaber, president) on the site of Platt Music Co. with an adjoining See’s Candy at 622 S. Broadway and a Bellin’s Tie Shop at 618 S. Broadway. The cafeteria could serve 10,000 people a day, The Times said. 620 S. Broadway as shown by Google Street View. Einar Petersen mural at Schaber’s Cafeteria, 620 S. Broadway. The cafeteria, with the motto “A good place to eat, a good place to meet” opened in April 1928 as what The Times called “the most up-to-date cafeteria in America.” Schaber’s had a Spanish decor and the 10-piece Pryor Moore orchestra played during the dinner hour, featuring “Spanish selections,” The Times said. It also had a Sturtevant “air washer” “which purifies every cubic foot of air,” The Times said. 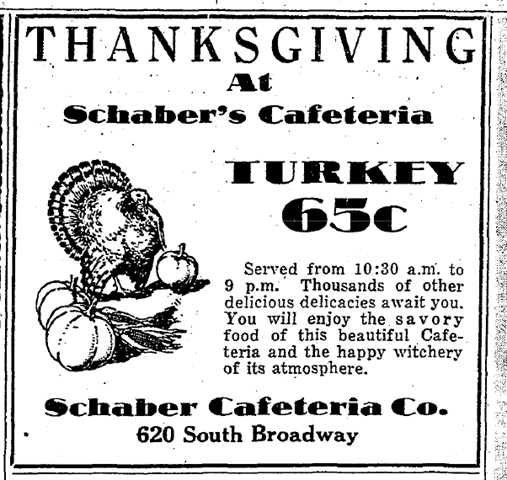 In 1946, Schaber’s was sold to Forum Cafeterias for $517,000. In 1956, the cafeteria altered and “modernized” the facade, and added a marquee, The Times said. And in a footnote to history, in 1949, James Earl Ray, the man convicted of killing the Rev. Martin Luther King Jr., committed his first crime by trying to steal a typewriter from the office of the Forum Cafeteria, Times staff writer Jerry Cohen wrote in 1968. In 1973, The Times reported that the Forum Cafeteria had been acquired by Consolidated Services Inc., giving the address as 680 S. Broadway. Schaber’s remained a Carl’s Jr. into at least 1987, according to the Los Angeles Public Library’s online directories of Los Angeles. This entry was posted in 1928, Architecture, Art & Artists, Downtown, Food and Drink, Found on EBay and tagged #DTLA, #EBay, 213, architecture, art, Broadway, Murals. Bookmark the permalink. Didn’t Elizabeth Short frequent this cafeteria or is that a myth? Are you planning your yearly visit to the Biltmore on the 15th? I have never run into anything to indicate she ever set foot in this place…. my mother worked at the Forum Cafeteria in Los Angeles. I have a photo of her in uniform. California from Missouri. She was 19 years old and attended Sawyer’s School of Business also. She met my Dad, Warren Erwin there. Boy this has been a trip down Memory Lane!!! My Great Aunt, Annie Mae Moore from Mooreville, MS worked there during WWII.